Kristen Bell attended the 2019 Golden Globe Awards on Sunday evening (January 6) in Beverly Hills, California. 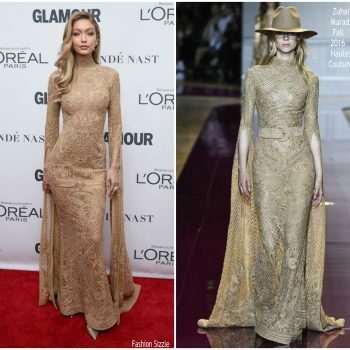 She wore a Zuhair Murad Resort 2019 gown styled with Harry Winston jewelry. 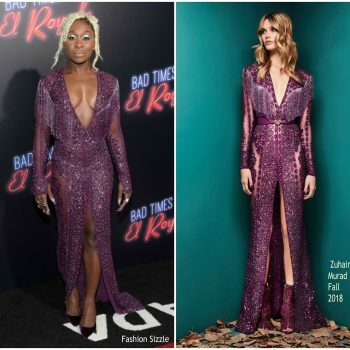 Cynthia Erivo wore a Zuhair Murad Fall 2018 embellished fringe dress to the Bad Times At The El Royale Hollywood premiere. She accessorized with Jimmy Choo heels & MESSIKA jewelry. 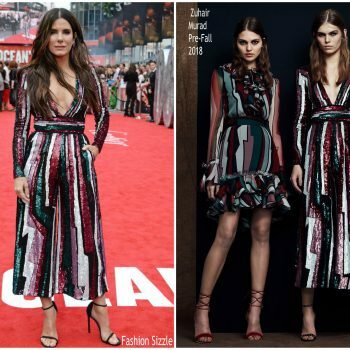 Kate Beckinsale attended 2018 Deauville American Film Festival on Sunday night (September 2) in Deauville, France. 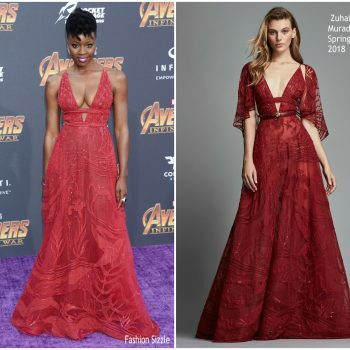 She wore a red Zuhair Murad Spring 2018 Couture beaded motif gown. Jenna Dewan attended the 2018 Billboard Music Awards held at the MGM Grand Garden Arena on Sunday (May 20) in Las Vegas. 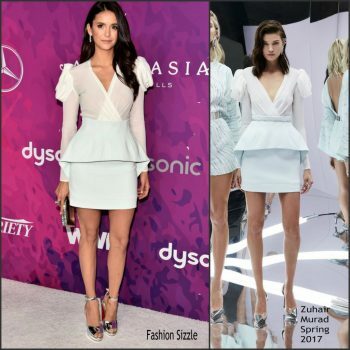 She wore a strapless Zuhair Murad Spring 2018 leather fringe dress. Sara Sampaio was in attendance at the Cannes Film Festival premiere of ‘Girls Of The Sun (Les Filles Du Soleil)’ today (May 12). 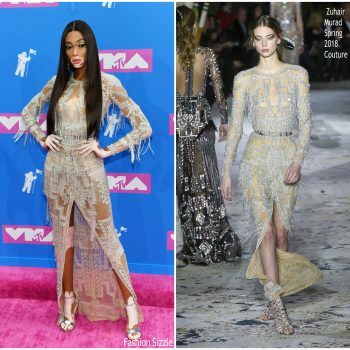 She wore a Zuhair Murad Spring 2018 Couture embroidered off-shoulder gown. 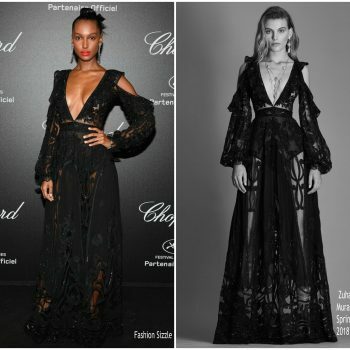 Jasmine Tookes attended the Chopard Secret Night during the 71st Annual Cannes Film Festival on May 11th, 2018. 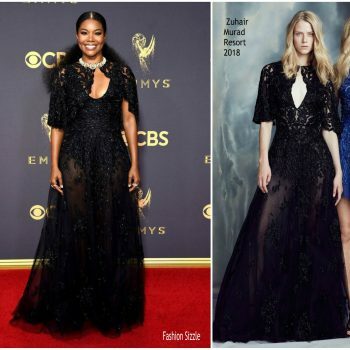 She wore a Zuhair Murad Spring 2018 black beaded cutout gown styled with Chopard jewelry. Danai Gurira attended the LA premiere of Marvel’s ‘Avengers: Infinity War’ LA on Monday (April 23). 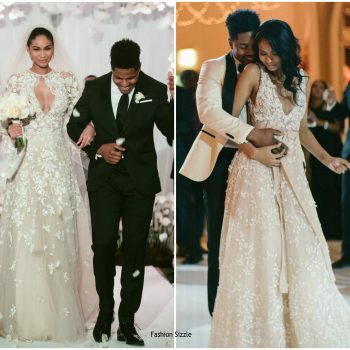 She is wearing a Zuhair Murad Spring 2018 gown. Elizabeth Olsen was in attendance at the 2018 Film Independent Spirit Awards on Saturday (March 3) in Santa Monica, California. 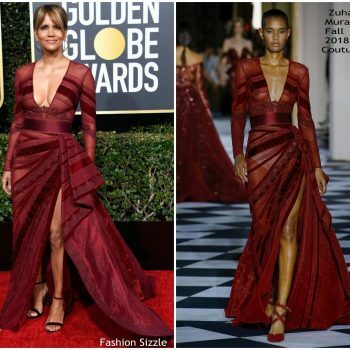 She wore a Zuhair Murad Pre-Fall 2018 deep red embroidered tulle midi dress. 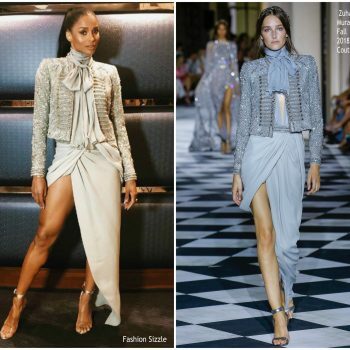 Naomie Harris attended the 2018 BAFTAs on Sunday (February 18) in London, England. 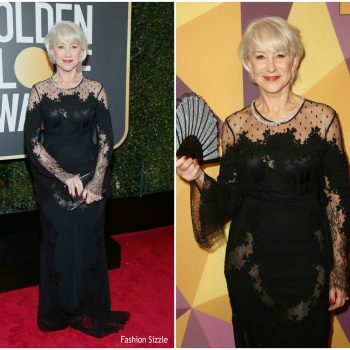 She wore a Zuhair Murad Spring 2018 Couture long beaded black + gold shimmer tunic with feathers & black crepe pants. Halle Berry attended the 2017 Toronto International Film Festival on Wednesday (September 13). 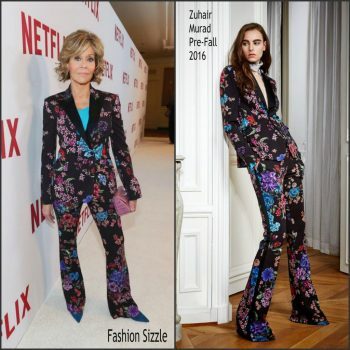 She wore Zuhair Murad Fall 2017 jumpsuit. 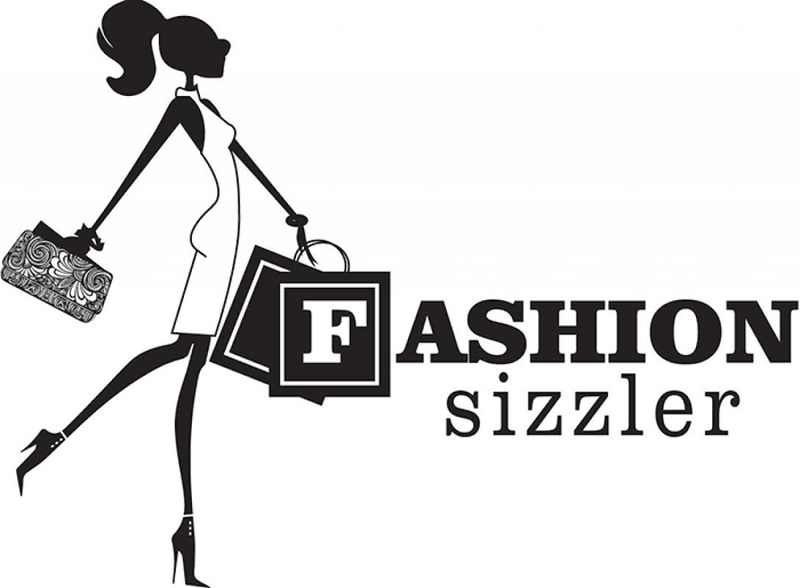 She styled her look Borgioni cognac diamond hoop earrings and Joelle diamond rings. 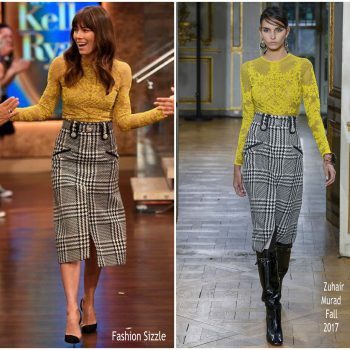 Kate Mara made a guest appearance on ‘The Late Late Show with James Corden’ on Tuesday (June 13) She wore a Zuhair Murad’s Pre-Fall 2017 design. Kate Mara attended the premiere of ‘Megan Leavey’ in New York City on Monday (June 5). She wore a black Zuhair Murad Fall 2017 leather and lace dress styled with black heels. 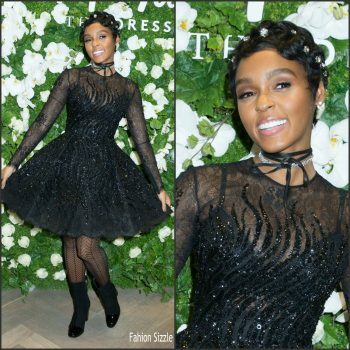 Janelle Monae attended Lord & Taylor celebrate The Dress Address at their 5th Avenue store on Thursday (March 23) in New York City. 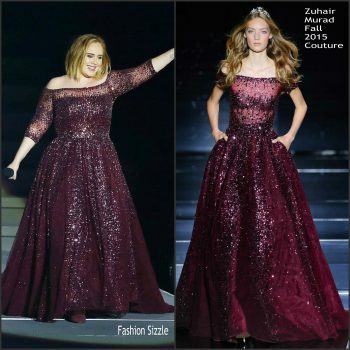 She wore a black Zuhair Murad Spring 2017 dress . Kristen Bell made a guest appearance on ‘Late Night with Seth Meyers’ on Wednesday (March 22) in promotion of her latest movie, Chips’. 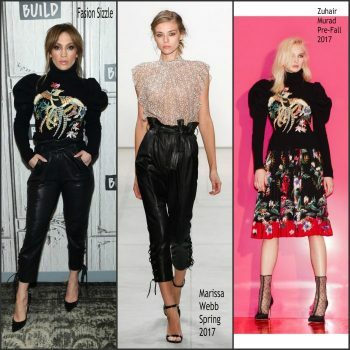 She wore a black Zuhair Murad Pre-Fall 2017 jumpsuit. Jennifer Lopez was in attendance at NBC Shades Of Blue Season 2 Premiere in New York City on Wednesday (March 1) to promote the second season of her hit crime drama Shades of Blue. Chrissy Teigen attended the 2017 Academy Awards held at the Dolby Theatre on Sunday (February 26) in Hollywood. 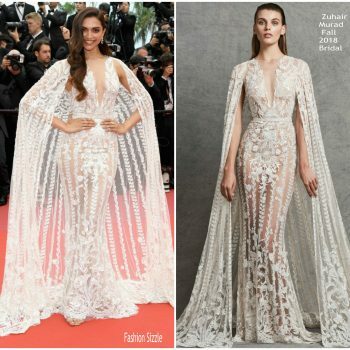 She wore a Zuhair Murad Spring 2017 Couture caped gown with embroidery . Céline Dion was in attendance at the 2017 Grammy Awards held at the Staples Center on Sunday (February 12) in Los Angeles. 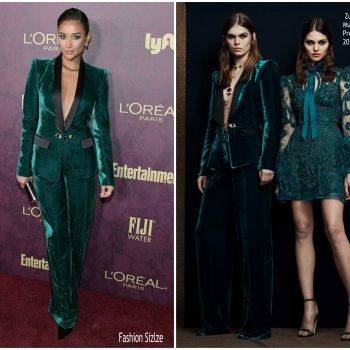 She wore an green emerald Zuhair Murad Spring 2017 Haute Couture gown. Sofia Vergara was in attendance at the the 2017 Screen Actors Guild Awards on Sunday, January 29, 2017, in Beverly Hills, CA. 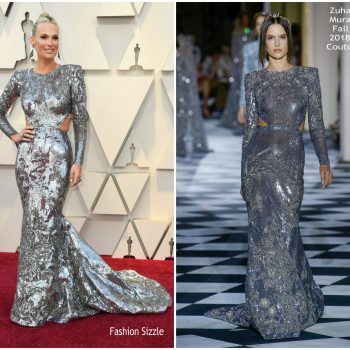 She wore a silver and black Zuhair Murad Spring 2017 dress. 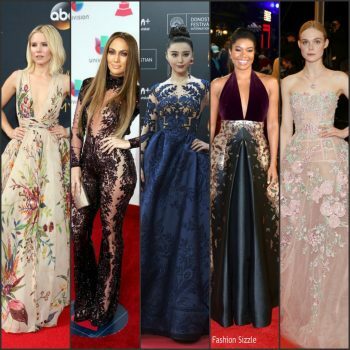 Olivia Culpo was in attendance at the 2017 Golden Globes on January 8, 2017, at The Beverly Hilton in Beverly Hills, California. 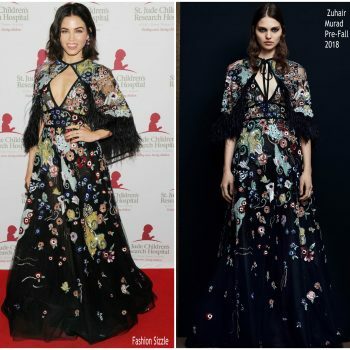 She wore a Zuhair Murad Fall 2016 Couture crisscross printed embroidered gown. 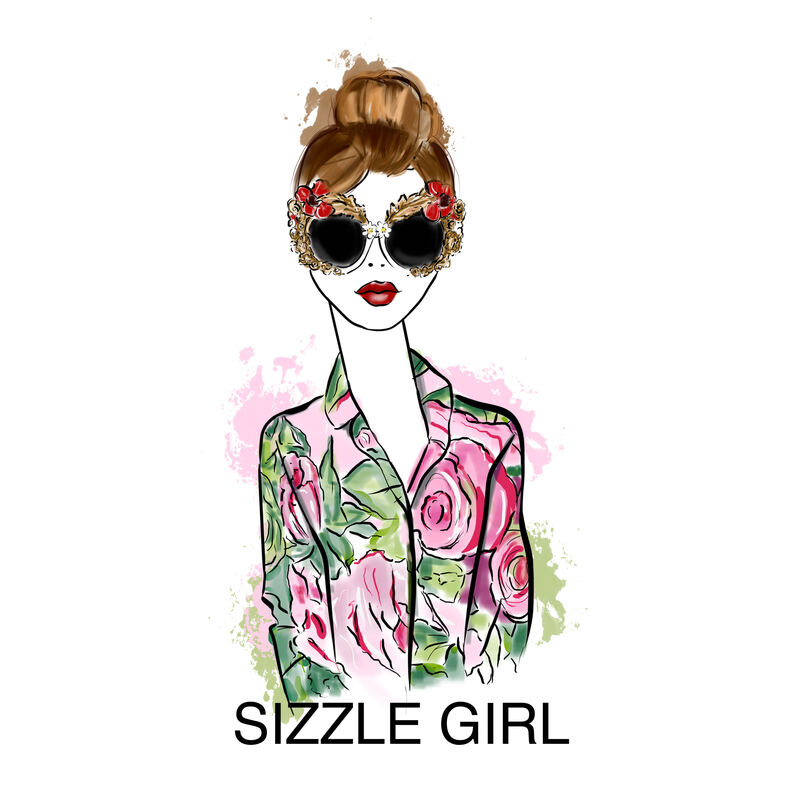 Lily Collins was in attendance at the 2017 Golden Globes on January 8, 2017, at The Beverly Hilton in Beverly Hills, California. 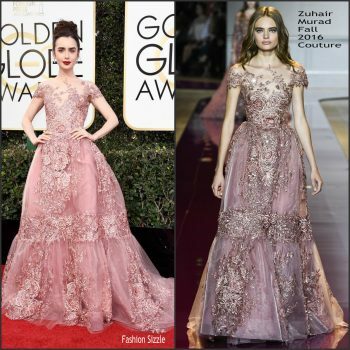 She wore a pink Zuhair Murad Fall 2016 Couture embroidered gown. Olivia Culpo was in attendance at the Z100′s 2016 Jingle Ball at Madison Square Garden on Friday night (December 9) in New York City. 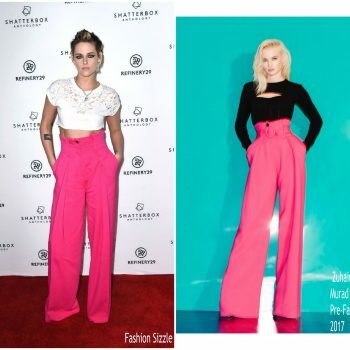 She wore a black Zuhair Murad Spring 2017 punto Milano knit embroidered jumpsuit. 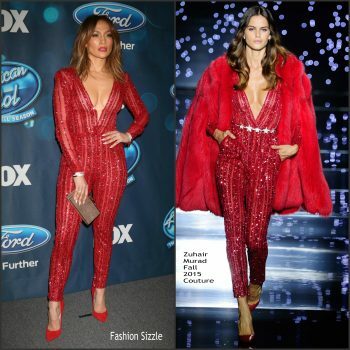 Jennifer Lopez was in attendance at the 17th annual Latin Grammy Awards ceremony in Las Vegas Thursday night. 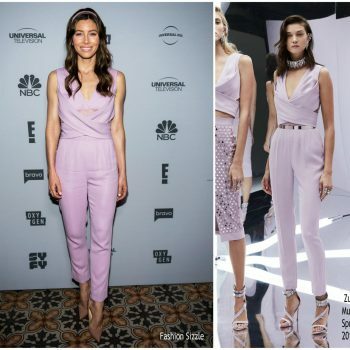 She wore a Zuhair Murad Fall 2016 Couture beaded violet jumpsuit . Actress Gabrielle Union attends 'The Birth Of A Nation' International Premiere screening during the 60th BFI London Film Festival at Odeon Leicester Square on October 11, 2016 in London, England. Actress Jane Fonda attends the 2016 Carousel Of Hope Ball at The Beverly Hilton Hotel on October 8, 2016 in Beverly Hills, California. Jennifer Lopez celebrated her 47th birthday on Sunday July 24 , 2016 in Las Vegas after her residency performance. Lucy Hale attended the 2016 Billboard Music Awards held at the T-Mobile Arena on May 22, 2016 in Las Vegas, Nevada. Actress Elle Fanning attends the 'Neon Demon' premiere during the 69th annual Cannes Film Festival at the Palais des Festivals on May 20, 2016 in Cannes, France. Alessandra Ambrosio attends 'The Last Face' Premiere during the 69th annual Cannes Film Festival at the Palais des Festivals on May 20, 2016 in Cannes, France. Jane Fonda attends Netflix's Rebels and Rule Breakers Luncheon and Panel Celebrating The Women of Netflix at the Beverly Wilshire Four Seasons Hotel on May 14, 2016 in Beverly Hills, California. Araya A. Hargate attended the premiere of The BFG during the 2016 Cannes Film Festival on Saturday night (May 14) in Cannes, France. 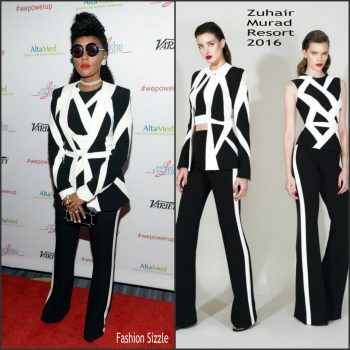 Janelle Monae attended the 2016 AltaMed Health Services' Power Up, We Are the Future Gala at the Beverly Wilshire Four Seasons Hotel in Beverly Hills, CA yesterday. After her photocall, Emily VanCamp attended the premiere of Captain America: Civil War at Vue Westfield this evening in London. 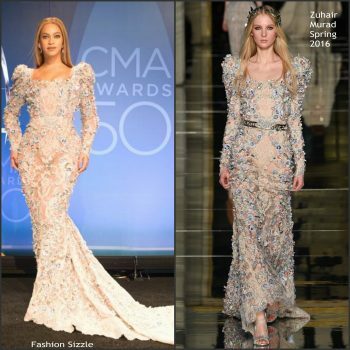 Jennifer Lopez wore a long sleeve Zuhair Murad Fall'15 Couture gown that has cosmic crystal constellation embroidery on American Idol. 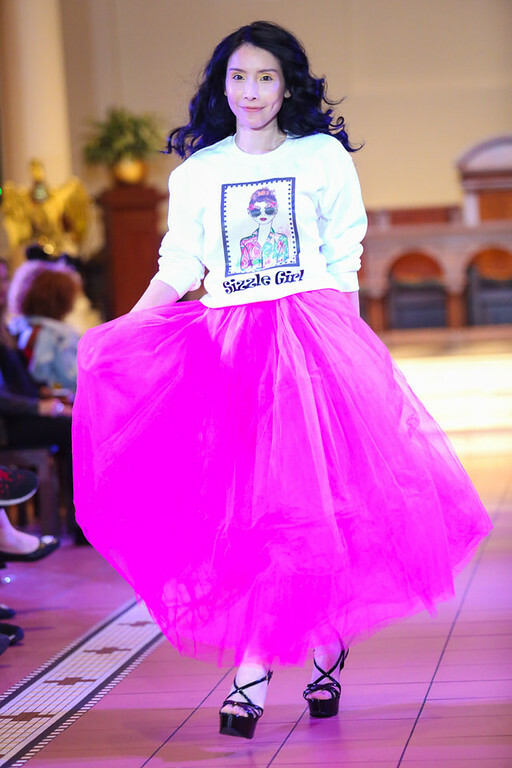 S She styled her look with center parted tresses and Butani diamond jewels. Priyanka Chopra attended the 88th Annual Academy Awards at Hollywood & Highland Center on February 28, 2016 in Hollywood, California. 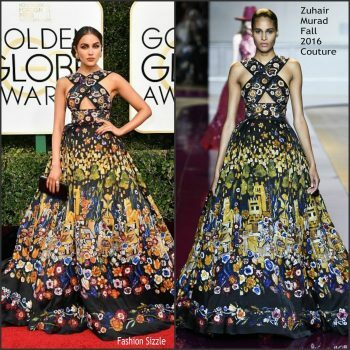 The Bollywood actress is wearing a strapless lace Zuhair Murad Spring 2016 Couture strapless gown.